January 19, 2019: COMMEMORATION OF ST. CANUTE, KING OF DENMARK, MARTYR. O holy King, Canute! the Sun of Justice had risen upon thy country, and all thy ambition was that thy people might enjoy the fulness of its light and warmth. Like the Magi of the East, thou didst lay thy crown at the feet of the Emmanuel, and, at length, didst offer thy very life in his service and in that of his Church. Thou didst offer thy martyrdom for the sins of thy people; offer it, now also, for them, that they may recover the true faith they have so long lost. Grant, we beseech thee, O Almighty God, that we, who celebrate the festival of blessed Canute, thy Martyr, may, by his intercession, be strengthened in the love of thy name. Through our Lord Jesus Christ, thy Son, who liveth and reigneth with thee, in the unity of the Holy Ghost, God, world without end. Amen. The Magi Kings, as we have already observed, have been followed to the Crib of Jesus by saintly Christian Monarchs; and it was just, that these should be represented on the Church's Calendar, during the season which is consecrated to the Mystery of his Birth. The eleventh century is one of the most glorious of the Christian era, and gave, both to the Church and the various States of Europe, a great number of saintly Kings. Among them, Canute the Fourth, of Denmark, stands pre-eminent by reason of the aureol of his martyrdom. He had every quality which forms a Christian Prince: he was a zealous propagator of the faith of Christ, he was a brave warrior, he was pious, and he was charitable to the poor. His zeal for the Church, (and, in those days, her rights were counted as the rights of the people,) was made the pretext for putting him to death: he died, in the midst of a sedition, as a victim sacrificed for his people's sake. His offering to the new-born King was that of his blood; and in exchange for the perishable crown he lost, he received that which the Church gives to her Martyrs, and which can never be taken away. The history of Denmark, in the eleventh century, is scarce known by the rest of the world; but the glory of that country's having had one of her kings a Martyr, is known throughout the whole Church, and the Church inhabits the whole earth. This power, possessed by the Spouse of Christ, of conferring honour on the name and actions of the servants and friends of God, is one of the grandest spectacles out of heaven; for when she holds up a name as worthy of honour, that name becomes immortalised, whether he who bore it were a powerful king, or the poorest peasant. We find the following life of this holy King given in the Lessons of the Breviary. 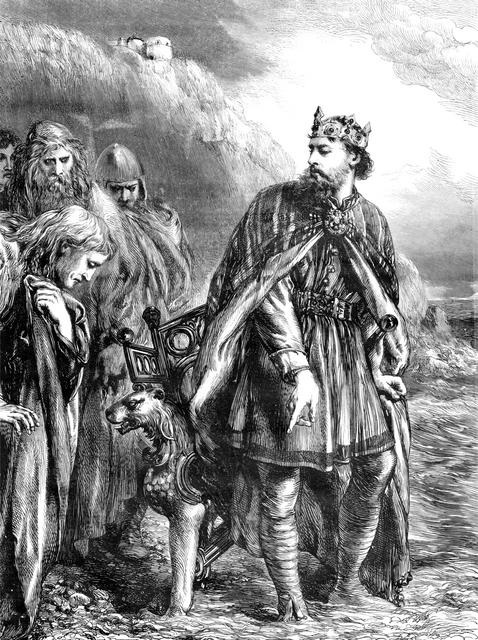 Canute the Fourth, son of Swein Estrithius, King of Denmark, was conspicuous for his faith, piety, and purity of life, and even from his infancy, gave proof of exceeding holiness. Having been elected, by the votes of the people, to the throne held by his father, he at once began zealously to promote religion, to add to the revenues of the Churches, and to provide the same with costly fittings and furniture. Being also inflamed with zeal for the propagation of the faith, he refused not to enter into just war with barbarous nations, which, when he had conquered and subdued, he subjected to the law of Christ. Having obtained several glorious victories, and increased the riches of his treasury, he laid his regal diadem at the feet of a crucifix, offering himself and his kingdom to Him, who is the King of kings, and Lord of lords. He chastised his body by fasting, hair-shirts, and disciplines. He was assiduous in prayer and contemplation, liberal in his alms to the poor, and ever kind to all, never deviating from the path of justice and the divine commandments. By these and other such virtues, the holy King made rapid strides to the summit of perfection. Now it happened, that William, Duke of Normandy, invaded the kingdom of England with a formidable army, and the English sought assistance from the Danes. The King resolved to grant them his aid, and entrusted the expedition to his brother Olaus. But he, from the desire he had of getting possession of the throne, turned his forces against the King, and stirred up the soldiers and the people to rebellion. Neither were there wanting motives for this rebellion; for the King had issued laws commanding the payment of ecclesiastical tithes, the observance of the commandments of God and his Church, and the infliction of penalties on defaulters; all which were made handle of by perverse and wicked malcontents, who began by spreading murmuring, exciting the people to revolt, and, at last, to plot the death of the saintly King. Foreknowing what was to happen, the King saw that he would soon be put to death for justice sake. Having foretold it, he set out to Odense, where entering into the Church of St. Alban, the Martyr, as the place of combat, he fortified himself with the Sacraments, and commended this his last struggle to our Lord. He had not long been there, when a band of conspirators arrived. They endeavoured to set fire to the Church, to burst open the doors, and to force an entrance. But failing in this, they scaled the windows, and with great violence threw a shower of stones and arrows upon the holy King, who was on his knees, praying for his enemies. Wounded by the stones and arrows, and, at last, pierced through with a spear, he was crowned with a glorious martyrdom, and fell before the altar, with his arms stretched out. Gregory the Seventh was the reigning Pontiff. God showed by many miracles how glorious was his Martyr; and Denmark was afflicted with a great famine and sundry calamities, in punishment of the sacrilegious murder which had been perpetrated. Many persons, who were afflicted with various maladies, found aid and health by praying at the tomb of the Martyr. On one occasion, when the Queen endeavoured, during the night, to take up his body secretly, and carry it to another place, she was deterred from her design by being struck with fear at the sight of a most brilliant light, which came down from heaven. St. Canutus, or Knut, the fourth of that name, king of Denmark, was natural son of Swein III, whose great uncle Canutus had reigned in England. Swein having no lawful issue, took care of the education of Canutus, who being endowed with excellent qualities both of mind and body, answered perfectly well the care of his preceptors and governors. It is hard to say, whether he excelled more in courage, or in conduct and skill in war; but his singular piety perfectly eclipsed all his other endowments. He scoured the seas of pirates, and subdued several neighboring provinces which infested Denmark with their incursions. The kingdom of Denmark was elective till the year 1660; wherefore, when Swein died, many pitched upon our saint, whose eminent virtues best qualified him for the throne; but the majority, fearing his martial spirit, preferred his eldest natural brother Harald, the seventh king of that name, who, for his stupidity and vices, was commonly called the Slothful. Canutus retired into Sweden to king Halstan, who received him with the greatest marks of kindness and esteem; but the king could never induce him to undertake any expedition against Denmark; on the contrary, the Christian hero employed all his power and interest in the service of his country. Harald dying after two years' reign, Canutus was called to succeed him. Denmark had received the Christian faith long before; some say in 826, but wanted a zealous hand at the helm, to put the finishing stroke to that good work. St. Canutus seems to have been pitched upon by providence for this purpose. He began his reign by a successful war against the troublesome barbarous enemies of the state, and by planting the faith in the conquered provinces of Courland, Samogitia, and Livonia. Amidst the glory of his victories, he humbly prostrated himself at the foot of the crucifix, laying there his diadem, and offering himself and his kingdom to the King of kings. After having provided for its peace and safety, and enlarged its territories, he married Eltha, or Alice, daughter of Robert, earl of Flanders, by whom he had a pious son, St. Charles, surnamed the Good, afterwards also earl of Flanders. His next concern was to reform abuses at home. For this purpose, he enacted severe, but necessary laws, for the strict administration of justice, and repressed the violence and tyranny of the great, without respect of persons. He countenanced and honored holy men, granted many privileges and immunities to the clergy, to enhance the people's esteem of them; and omitted nothing to convince them of their obligation to provide for their subsistence by the payment of tithes. His charity and tenderness towards his subjects made him study by all possible ways to ease them of their burdens, and make them a happy people. He showed a royal magnificence in building and adorning churches, and gave the crown which he wore, of exceeding great value, to the church of Roschild, in Zealand, his capital city, and the place of his residence, where the kings of Denmark are yet buried. He chastised his body with fasting, discipline, and hair-cloths. Prayer was his assiduous exercise. When William the Conqueror had made himself master of England, Canutus sent forces to assist the vanquished: but these troops finding no one willing to join them, were easily defeated in the year 1069. Some time aſter, being invited by the conquered English, he raised an army to invade this island, and expel the Normans; but through the treacherous practices of his brother Olas, or Olaus, was obliged to wait so long on the coast, that his troops deserted him. The pious king, having always in view the service of God, and judging this a proper occasion to induce his people to pay tithes to their pastors, he proposed to them either to pay a heavy fine, by way of punishment for their desertion, or submit to the law of tithes for the pastors of the church. Their aversion to the latter made them choose the tax, to the great mortification of the king, who, hoping they would change their resolution, ordered it to be levied with rigor. But they, being incensed at the severity of the collectors, rebelled. St. Canutus retired for safety into the isle of Fionia, and was hindered from joining his loyal troops by the treachery of Blanco, an officer, who, to deceive him, assured his majesty that the rebels were returned to their duty. The king went to the church of St. Alban, the martyr, to perform his devotions, and return God thanks for that happy event. This the rebels being informed of by Blanco, they surrounded the church with him at their head. In the mean time the holy king, perceiving the danger that threatened his life, confessed his sins at the foot of the altar, with great tranquillity and resignation, and received the holy communion. His guards defended the church doors, and Blanco was slain by them. The rebels threw in bricks and stones, through the windows, by which they beat down the shrines of certain relics of St. Alban and St. Oswald, which St. Canutus had brought over from England. The saint, stretching out his arms before the altar, fervently recommended his soul into the hands of his Creator: in which posture he was wounded with a javelin, darted through the window, and fell a victim to Christ. His brother Benedict, and seventeen others, were slain with him, on the 10th of July, 1086, as Ӕlnoth, a contemporary author, testifies, who has specified the date of all the events with the utmost exactness. His wicked brother Olas succeeded him in the kingdom. God punished the people during eight years and three months of his reign with a dreadful famine, and other calamities; and attested the sanctity of the martyr, by many miraculous cures of the sick at his tomb. For which reason his relics were taken up out of their obscure sepulchre, and honorably entombed towards the end of the reign of Olas. His successor, Eric III, a most religious prince, restored piety and religion, with equal courage and success, and sent ambassadors to Rome, with proofs of the miracles performed, and obtained from the pope a declaration authorizing the veneration of St. Canutus, the proto-martyr of Denmark. Upon this occasion a most solemn translation of his relics, which were put in a most costly shrine, was performed, at which Ælnoth, our historian, was present. He adds, that the first preachers of the faith in Denmark, Sweden, and Norway, were English priests; that the Danes then zealously embraced the Christian religion, but that the Swedes still continued more obstinate, among whom Eschil, an Englishman, received the crown of martyrdom, while he was preaching Christ to certain savage tribes. Also Read – January 19, 2019: Ss. Marius, Martha, Audifax, and Abachum, Martyrs. St. Canute, pray for us.